This promotional CD-R surfaced in November 2003 and soon become one of the most controversial releases I have ever listed on the site. Not long after listing it I was requested to remove it from the site by Chrysalis (no Legal Warning was given but I did remove it initially). This was the first and only time I have ever had any issues with any record company and the listing of items on this site. The disc itself features a custom printed disc with a track listing on the inlay itself. It could just be a coincidence that the B-side of the same name was announced on Garbage.com on May 20, 2005. The release has never been confirmed to be a Garbage release, and I doubt that this item will ever surface again. If you were the person who managed to get this release from eil.com please do get in touch and confirm if this is or is not a Garbage release, if you wish to remain nameless you have my word that I will not publish or pass on your details. On 30/10/2003 at 15:52:41 (GMT) The Garbage Discography was the first fan site to uploaded information about a new 1 track CD-R acetate from the USA that appeared for sale online. The item was for a new Garbage release entitled “Never Be Free”. Due to the fact that I was unsure if the item was official I contacted the UK branch of Chrysalis to find out some more details on the item. I got a reply saying that they didn’t issue the item and that I should contact EMI as they may have issued it on behalf of Chrysalis. 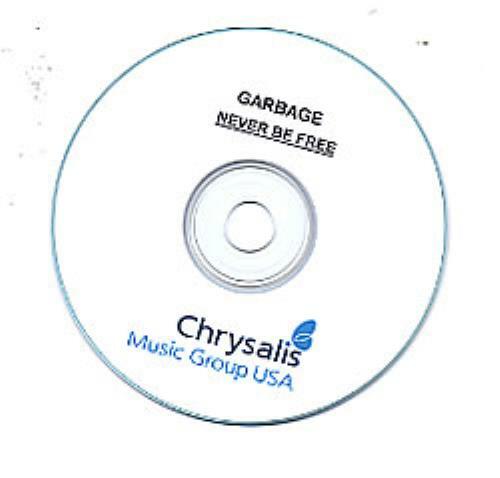 “This is to advise that the composition entitled “Never Be Free” (co-written by John Lowery) that you reference in your email of October 30, 2003 to Chrysalis is an unreleased and unfinished musical composition which has not been authorized for any use of whatsoever nature. Your site’s utilization of said composition without authorization infringes upon the rights of Chrysalis and we are hereby demanding that you cease and desist any use of the composition including the unauthorized use of such on your website. Anyhow Chrysalis Music Group failed to get back in touch with me regarding how I “infringed their copyright”. Therefore the item was re-added to the website. The way I saw it was one of the staff at Chrysalis Music Group leaked the release. As the release was now in the public domain and therefore an historical fact (as in the fact that the disc itself exists). I also used no information provided by Chrysalis Music Group on the web site, so how could I have possibly infringed their copyright? It looked to me as if Chrysalis Music Group may have been using scare tactics. From the reaction I got from Chrysalis I think it is safe to say that it’s an official Chrysalis release however please remember that Garbage was NEVER mentioned by Chrysalis in their reply, despite my email asking if this was an official Garbage release or not. At 23:02 GMT (Nov 5) A post on the official board was left that read the release was not a Garbage recording. This came from a source who were close to the band. was this a cover up? The version of “Never Be Free” on the disc which is causing the problem is co-written by John Lowery. This information was included in the first paragraph of the email from Chrysalis Music Group. Who the hell is John Lowery I hear you say? This might be a coincidence and therefore is only speculation but check out the real name of Marilyn Manson guitarist “John 5″. This also backs up information which was posted on the fansite ‘Garbage Box‘ (later became Garbage Disco Box) on June 1 of that year. Is this the release the same as what the Daily Record reported earlier in the week? We know Shirley has been on about working with MM. It would also make sense why Chrysalis was so pissed off about this CD-R getting out (maybe they should look at who they employ). Only time will tell I guess. I am really unsure if this item is a Garbage release or not, chances are it could be some demo or working loops or something. I’m can not say for sure and will not say that this is 100% Garbage if it is at all, there are no where near enough facts which were leaked to say so for sure. There are only a handful of people who know if this is official or not and they are the people who recorded it and the person who has purchased it the way I see it is until someone comes forward or more promo’s surface we will not know the answer. The following article was first published in 2003 on a previous version of this website and is the History of this CD-R of Never Be Free. Please note it could just be a coincidence that the B-side announced on Garbage.com on May 20, 2005 was also called Never Be Free, The release was never confirmed to be a Garbage release, and I doubt that this item will ever surface again.